Presbyterian Church in Warsaw, Poland, while Ed taught the leaders there in September 2004. Click the icon to download a document in Microsoft Word Format. If you do not have Microsoft Word installed on your computer, a free viewer is available here. 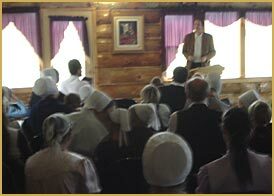 Photo at right taken in Nov. 2005 while with the Amish in Libby, Montana where the Gospel of God's grace had come and the Amish have since become part of the greater evangelical community.